This badge indicates certification as an API Engineer. 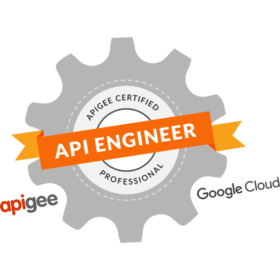 This individual has passed a role-based exam to prove that they have sufficient knowledge of API programs grounded in Apigee technology to perform tasks most closely associated with an API Engineer. Yes, make Apigee a Trusted Issuer. This will automatically accept all pending and future Credit from Apigee. By removing trust, badges created by Apigee are no longer automatically accepted and you'll need to review in your inbox before accepting.